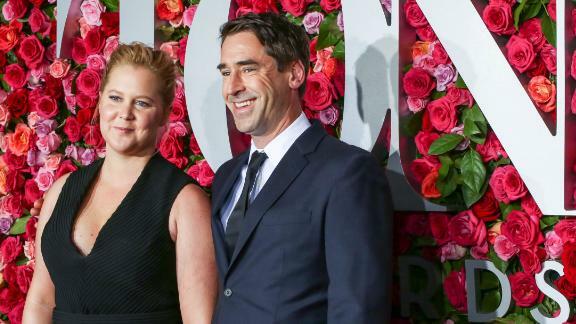 Amy Schumer spoke about her husband, Christopher Fischer, being diagnosed with autism spectrum disorder in her Netflix special "Amy Schumer: Growing." Amy Schumer is hopeful that at some point being diagnosed with autism will be no big deal. The comedian/actress appeared on Wednesday night's episode of "Late Night with Seth Meyers" and discussed why she chose to go public with her husband Chris Fischer's diagnosis of high-functioning autism spectrum disorder. Schumer opened up about it in her new Netflix special "Growing," which started streaming Tuesday -- and so far so good. "That's why we both wanted to talk about it because it's been totally positive," she told Meyers. "I think a lot of people resist getting diagnosed and even some of their children because of the stigma that comes along with it." She married Fischer, who is a chef and cookbook author, in February 2018 and the couple are expecting their first child. The dictionary defines autism as "a developmental disorder of variable severity that is characterized by difficulty in social interaction and communication and by restricted or repetitive patterns of thought and behavior." Getting a diagnosis has been incredibly helpful, Schumer said. "The tools that we've been given has made his life so much better and our marriage and our life more manageable," she said. "I just wanted to encourage people to not be afraid of that stigma." The star pointed out that at one point people were embarrassed to admit that they had attention deficit disorder and now many people speak up about having it. "I think there are a lot of people with autism who go undiagnosed when I think their life could be better if they got those tools," Schumer said.